Distinguished Professor in the College of Engineering and Computer Science Pramod K. Varshney has received the University of Illinois Department of Electrical and Computer Engineering (ECE) Distinguished Alumni Award. The ECE Alumni Board of Directors recognizes a select few of their most successful alumni whose remarkable achievements and leadership across a variety of disciplines have enhanced the reputation of ECE ILLINOIS. Varshney (BSEE ’72, MS ’74, PHD ’76 from University of Illinois) was recognized for “contributions to the science of information fusion, as a pioneering researcher and distinguished educator.” The Distinguished Alumni awardees were celebrated at the 46th ECE Alumni Awards Banquet on Friday, Sept. 11, and at a Distinguished Alumni Panel the day before. Varshney is a Distinguished Professor of Electrical Engineering and Computer Science, Director of the University’s Center for Advance Systems and Engineering (CASE) and an adjunct professor of radiology at Upstate Medical University. His current research interests include distributed sensor networks and data fusion, detection and estimation theory, wireless communications, physical layer security, image processing and radar. He is widely known for his seminal contributions in the area of distributed inference. 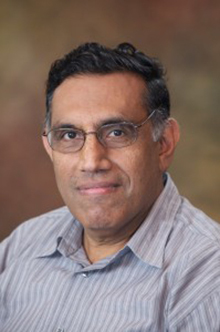 Varshney is an IEEE Fellow, founding member of the International Society for Information Fusion and the author of the definitive text Distributed Detection and Data Fusion, published by Springer-Verlag in 1997. His prior honors include the IEEE Third Millennium Medal (2000) the Syracuse University’s Chancellor’s Citation for Exceptional Academic Achievement (2000), the IEEE Judith A. Resnik Award (2012), a national honor given to one scientist each year for outstanding contributions to space engineering, and the honorary doctor of engineering (2014) from Drexel University.